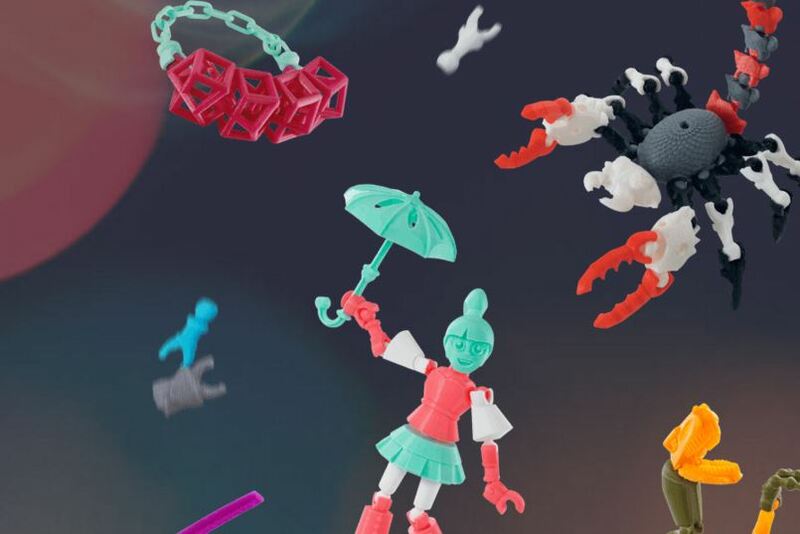 Does the future of kids toys lie with 3D Printing? Anyone who knows me knows I love 3D printing! I also have a very curious 5 year old son, who always wants to see my 3D printer in action and always asks “what are you printing now Daddy?“. So when I came across the ThingyMaker, a 3D printed designed to print toys, I was very excited in deed! The concept behind ThingyMaker is quite simple, you (or your children if you really have to share), can customise and 3D print toys! Yes I’ve seen 3D printed toys, there are 100s of 3D models available for free to download and print from sites such as Thingiverse, but what ThingyMaker promises to do is make the process as simple and straight forward as possible, so in theory even a child, with little or no knowledge of 3D modelling, or 3D printing, can create their own 3D printed toys. The actual hardware inside ThingyMaker doesn’t look to offer anything new, it appears to be a single extruder (it prints 1 colour), inside an enclosure, and possibly a heated build plate (although finding exact spec has proven difficult). But to me it has all the essentials it needs as an introduction for kids to 3D printing, and it’s even quite cute and toy-like in its design. 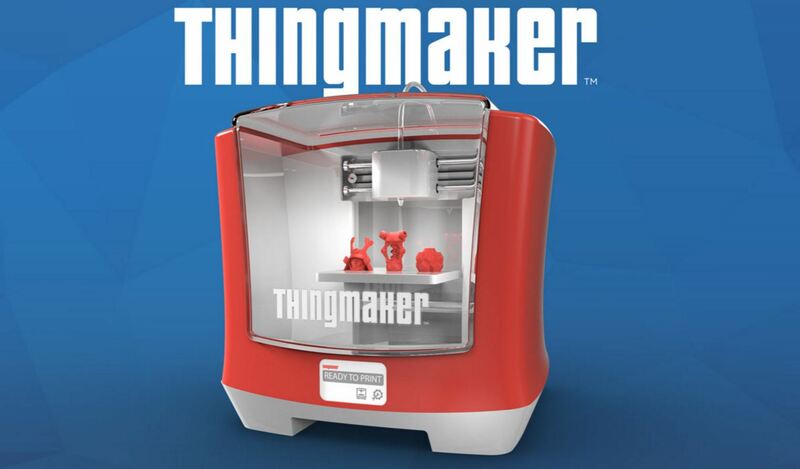 Alongside the 3D printer is the ThingMaker Design app, which is where you can design and customise your toys. It’s available for free on the Apple App Store and Google Play. I downloaded the app, and had a very quick play, and to be honest the app really did exceed my expectations. The way you build your toys is very straight forward and intuitive; you simply drag components into the view-port and the parts snap together, so you know instantly if what your designing will actually fit together. You can then pull, rotate, swap and even colour the different parts. There also appears to be 100’s of components, giving you an almost infinite number of possible combinations to build. 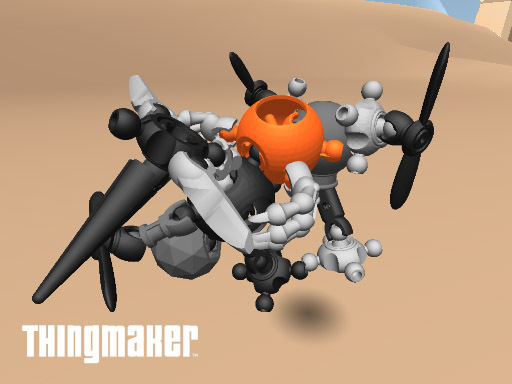 I had a very quick play in ThingMaker Design, and came up with some kind of helicopter-space-creature, which had very little “design” and is merely a mash-up of components I stumbled across! However it did show how quickly anyone could manufacture a unique “toy”, with no experience of 3D modelling or manufacturing. Once you’ve created your “masterpiece”, you can then export it to be 3D printed, and this is the part of the app which really impressed me. The app will de-construct and align all the components so you can print them straight away, and it will even separate the different colours into different prints, so you could in theory print in the correct colours if you have the right coloured plastic filament. Once the app has done this, you can follow a link on your PC, and you can download the components to then print them on a 3D printer, pretty neat right? Downloading the parts to be printed. The last step does seem a bit “clunky”, but I’m guessing that when the 3D printer is released on sale later this year you won’t need to manually download you design and send them to your printer, instead I imagine the app will communicate directly with the ThingMaker printer and automatically print the parts. If it doesn’t I’ll be very surprised. But for now we’ll just have to do things manually, and I will be testing the printing side of things very soon. Perhaps I’ll let my 5 year old have a go, and see what he creates, and of course print it! I’m sure it’ll be a random mash-up of skulls, wings and flowers! 3D printed toys and parts in various colours. Being able to design and create unique toys is going to be amazing for children (and us bigger kids), but I also see another massive advantage, you can re-print any broken, lost or even chewed parts in minutes. But will this also de-value the toys? Will there be an unlimited supply of components, or will Mattel be very clever in limiting the number times a certain component could be downloaded or printed? And will they expect users to pay for “special” components via in app purchases? Will we have to buy a licence to make these toys? The price for the ThingMaker (pre-order here) is a mere $300 / £210, which is very cheep for a 3D printer, so I can’t honestly see Mattel selling the printer at this price, and giving away all it’s content and apps for free, they just wouldn’t make any money, would they? But here’s a thought, will Mattel expand on its current offerings? 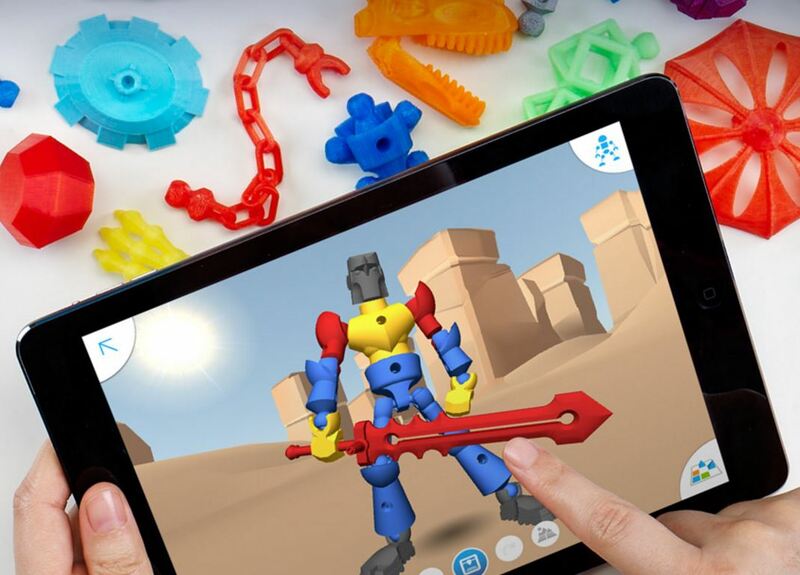 Will they allow users to 3D print other items, perhaps Barbie accessories, or Hotwheels cars? Will I be able to even print non-toy items, something like a broken oven knob, or remote control battery cover because mine has gone walk-abouts again? The whole concept of printing toys at home certainly seems very novel and fun. I believe the “fun” will be in the designing, printing and constructing the toys, rather than actually playing with them, much in the same way as a child may play with playdoh; the fun is in the process rather than making something to keep. But to me the ThingMaker is more than just a toy, it’s a way to make 3D printing accessible to everyone, and to become part of a normal household, much in the same way as PCs and mobile phones have become over the past 20 years. Once people see the potential uses for 3D printing, people will want to learn, engage and to fully see how 3D printing can be more than just a novelty. 3D printing, I predict, will become part of our everyday lives, but as to whether it’s just for fun, or for something more serious, only time will tell. Until then, I’m going to have fun creating!